The idea of "(how does the silver cloud s)ou(nd?)" 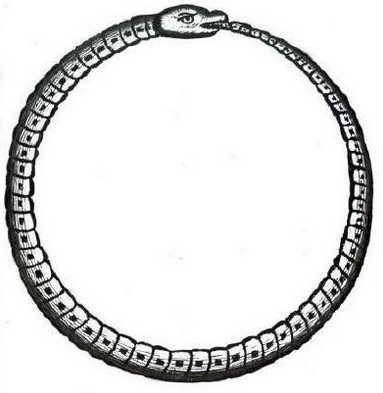 comes from the Ouroboros - Zyklus I. In this cycle I try to take a close look at certain aspects of music in the ouroboros-piece (colours, layers, rhythmic structures, harmony, etc. - one can call them "found objects") and to go deeper - to discover specific tendencies, develop them and turn them into independent expressions. In this way, I create pieces which I may later combine in the ouroboros-cycle under different aspects as well. The cycle can grow in all possible directions, there is almost no end to its expansion and the development is not limited by my own concepts or presuppositions. I listen to it, discover something interesting, try to understand the way it functions, learn to think in this manner and help it to express itself. Hence is the title: ouroboros is an ancient symbol depicting a snake or dragon swallowing its own tail, constantly creating itself and forming a circle. It often represents self-reflection or cyclicality. Every new piece or version of the cycle offers a new perspective, a new view of the same music. The name "how does the silver cloud sound?" has two letters from the main title "OUroboros", therefore everything else is in parentheses: (how does the silver cloud s)ou(nd?). Here I took a closer look at the piano's character in 'ouroboros'. Most of the time, it has some underlining, accompaniment or commentary function. The piano stands at some distance to everything. I've become interested in hearing what the piano could say if we were to let it speak. I started to work on the version for piano and tape. As a starting point for both instruments I used the original material from 'ouroboros'. With the tape I wanted to create another musical layer, to which the solo piano is strongly related: as a comment, a reaction or complement. But very soon I had something that wasn't fitting any more in to this role: it wanted to express itself, to be developed. I followed this wish. So, I was creating a duo, but I decided to hide the tape part. Just as you would speak to an imaginary, non-existent conversation partner, or hear only one part of some dialogue . The second part is to be anticipated or filled up with your imagination. Similar experience occurs when reading antique poetry: most of that literature is incomplete, many passages are faded - you read these fragments and you guess the meaning, replace the empty phrases with your own fantasy. For me it is very interesting: it is never the same, the content, meaning and emotion are always moving. I was working on this "duo" until quite a late state, until I realized that I don't need the tape part any more: the texture of the piece was filled with the question marks, something there is suppressed, never fully expressed or only suggested. That's why the broken texture, dynamic contrasts, certain discontinuation of texture's density, large pauses, or pauses at some moments where one would expect continuation, etc. I didn't need the tape part any more. The piece became an "imaginary duo" - listening, commenting, reacting with few moments where the piano comes to speak. Some small living thing, which is between wishing and not daring.